I attended the SOF Care Coalition Conference this past May, and one of the presenters was Dr. Cagan Randall DC, Diplomate of the American Chiropractic Neurology Board (DACNB) from the Carrick Brain Center. I was very impressed by their unconventional approach to therapy, recovery, and treatment for PTSD/TBI. Please refer to some of the videos we posted on the conference some weeks ago. From the beginning, my experience was extremely positive after first being contacted by a woman named Jodi, who is the Assistant Coordinator of Veteran and Military Affairs. Everything, from their emails to phone calls, you get the feeling that they genuinely care about veteran’s issues, and are truly invested in your care throughout the entire process of your treatment. I arrived at the clinic at 8:00am, and was warmly received by the entire staff. It was immediately noticeable that the environment created, is one that is very positive and encouraging for therapy and the healing process. Jodi met me and brought me to a veterans only room, where veterans hangout in between treatments. She proceeded to give me the run-down of the day and the next two weeks. The first day was a series of tests and evaluations, and then ended by sitting down one-on-on with the staff clinician to go over the results. The first test was the Computerized Dynamic Posturography (CDP). Computerized Dynamic Posturography (CDP) is a clinical assessment technique that can help diagnose posture and balance disorders. It’s used to evaluate the various systems – sensory, motor and central nervous – that affect posture and balance. 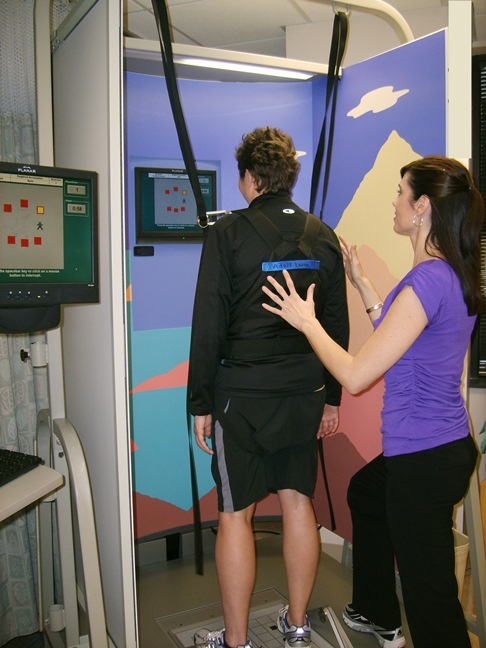 CDP tests the patient’s posture control system using a combination of visual stimuli and support surfaces. The patient stands on a horizontal platform that moves, challenging the ability to maintain balance. At the same time, the environment generates visual stimuli that can be used to assess how the patient uses visual cues to maintain his or her balance. The neurologist performs various specific tests under these conditions to measure the body’s reaction to unexpected movements. Measurements from these tests are combined with measurements from the VNG testing help the doctors further pinpoint the affected areas of the brain. The second test was the a series of eye tests, incorporating head movement and verbal responses to the symbols being shown. While conducting these tests, you wear a sensor on your head, and start by turning your head continuously horizontal back-and-forth, while answering which direction the symbol points. You repeat this exercise by moving your head up and down as well as side-to-side. The third test was Videonystagmography (VNG). Balance problems, dizziness and other issues associated with the vestibular system, and the associated vestibulo-ocular reflex can be assessed through VNG testing. VNG consists of a series of tests to evaluate how well the eyes respond to information from the vestibular system. During the tests, the patient wears a set of infrared goggles that record eye movements, as the eyes follow moving visual targets. In addition to enabling the care team to detect signs of central nervous or neurological problems, VNG can indicate whether the vestibular system is responding appropriately to the stimulation. VNG testing is considered the standard for testing vestibular function, because it tracks eye movements directly, rather than measuring the muscles surrounding the eyes as other similar tests do. The fourth test was the lovely impact test that we all love so much. We have done this in the past to provide a baseline for pre and post TBI. This was the same one that most of us have done both pre and post deployment. They utilize this to establish a baseline for the two weeks of treatment. The fifth event was an interview with a licensed psychiatrist. They utilized the CAP system to score you from mild to serious PTSD. The last part of the day you sit down with the the doctor that has been assigned to you for the two weeks of treatment. Dr. Cagan Randall DC, DACNB went line-by-line, and discussed every question on the very lengthy questionnaire that I had filled out prior to my arrival. He then proceeded to do the same thing in detail, with the results from each test that I had completed throughout the day. He then completed the most thorough neurological evaluation that one will ever have, as well as a gait analysis. Once complete, he developed the treatment plan for the next two weeks. Goals vary from correcting sleep issues, reduction of stress, fixing balance, nausea issues, and many more. I apologize for any inaccuracies or incorrect terms, I am obviously not a Doctor. I am writing this to get the word out to our community about their process, and to take any questions that are out there. I know a lot of our guys are feeling a lot of these symptoms, and since I'm here, I figured I would share a bit of my experiences and get you answers to any questions you may have. Please comment below and I'll have the staff answer them.